A safe, relaxing, energising setting, with great weather, comfortable accommodation, easy accessibility – just over three hours from London. Set in beautiful landscaped gardens, Villa Dinari has everything you need to host your training course; lots of covered open-air spaces where you can work in large or small groups, adaptable interior spaces should the weather turn cold – not often! – and a heated swimming pool, hammam and gym for your clients to relax when training is over for the day . At Villa Dinari we are becoming increasingly well known as a venue for inspirational training courses and conferences of all kinds, from energy alignment and training for yoga teachers to developing leadership in marketing and media and growing your own business. 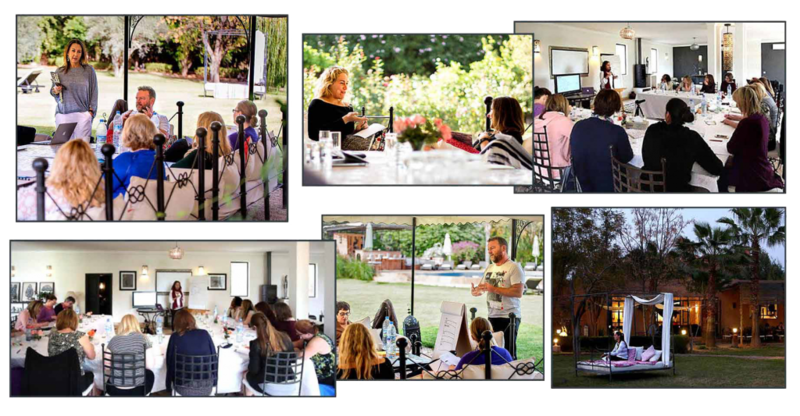 We are proud to have hosted events for such internationally-recognised trainers as Sháá Wasmund MBE, (Shaa.com), Yvette Taylor (The Energy Alignment Method), and Sherilyn Shackell (The Marketing Academy). I could write all day about this place but I think the fact I’ve been there 12 times probably says it all. I’ve stayed at Amanjena, Mamounia, all the 5 Star Riads .. and nothing comes close. 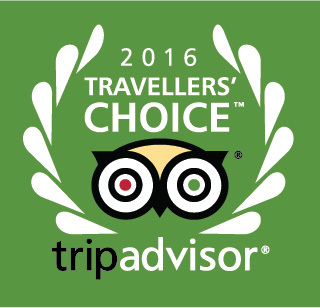 It’s the comfort, the hospitality, the beautifully decorated rooms and the incredible food. Heather and Abdul are the warmest, most giving hosts anywhere. Only a twenty-minute drive from the bustle of Marrakech, Villa Dinari is a calming world of its own, in beautifully landscaped private gardens with a heated swimming pool, a choice of accommodation and a private hammam and spa. 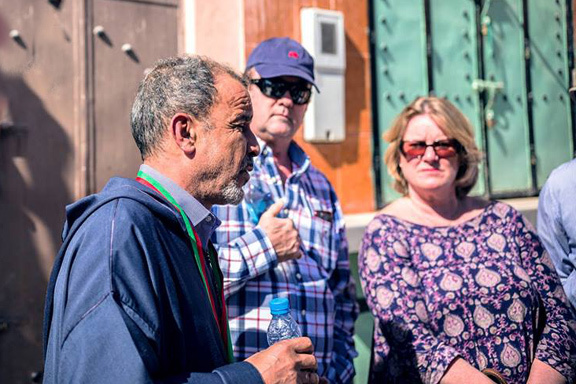 One of our main claims to fame is the quality of our food – Moroccan with a Villa Dinari twist – and we can cater for all special dietary requirements as well provide healthy mid-morning and tea-break snacks. For training sessions we supply basic equipment, and high-quality video and audio equipment can be hired locally. Such a beautiful venue but it was dwarfed by the spirit, love and generosity of the team at Villa Dinari. We took a group of twenty on a four-day business training, with differing diets and multiple extra requirements. Everything was SO easy to organise with the team and it was so peaceful, relaxing and wonderful to spend some time in the sunshine in such a beautiful venue. We’re already planning three more visits this year, some for training and some just to switch off. Why Villa Dinari? Because from the moment you arrive they look after you, the quality of everything is great. It has a lovely family feel, even with the staff. It’s so beautiful; there’s a stylishness and elegance about the place. And Abdul’s a great party geezer! 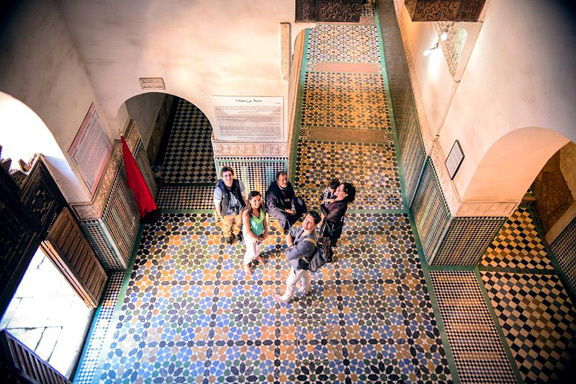 To experience the sights and evocative sounds of Morroco, Abdul Benhrima, one of the owners of Villa Dinari and one of Morocco’s top tour guides, can arrange a private guided tour of Marrakech, or perhaps a ‘Shopping in the Souks’ expedition to some of the hidden corners of the fabulously colourful Medina. If you want to stay in a private oasis-like paradise where you’ll be spoilt rotten in luxurious surroundings – stay here. If you want to feel like you’ve been welcomed into the home of the most gracious, interesting and welcoming hosts who you’ll feel you’ve known for years – stay here. If you want some peace & tranquillity less than four hours from London door-to-door and just 20 minutes away from the cultural centre of Marrakesh – stay here. Seriously, this place is truly special.